As has been mentioned previously, the current version of Cubiquity is no longer under active development as the focus has shifted to a replacement ‘Cubiquity 2’ system which is being developed outside of the ‘Volumes of Fun’ brand. Although the replacement system is still a long way from being ready, I feel it is time to remove the current version from the Unity Asset Store. The reason is that I don’t want to encourage people to use a system which I no longer have the time and resources to support, and I think that having the system available on the asset store does exactly this. Cubiquity for Unity3D was developed under Unity 4 and has only limited testing under Unity 5, and as the Unity 5.x series progresses I’m increasingly becoming aware of problems which I don’t have time to investigate. The system will remain available on BitBucket as it is open source software, but that provides a slightly higher barrier to entry and comes with a warning about the system no longer being developed. I’m expecting that Cubiquity 2 will go on GitHub to avoid any confusion between the two versions, but more on that in the future. Voxeliens is a retro-style arcade shooter and is essentially a 3D voxel-based version of Space Invaders. We released the game in 2012, showed it off at the Develop Conference and have had it accepted for Steam Greenlight. However, as mentioned in several previous blog posts, time is no longer on our side and we are re-focusing our efforts on the next version of Cubiquity. Therefore we have decided to release Voxeliens for free under the MIT license. It now lives on BitBucket alongside PolyVox and Cubiquity (our voxel engines) and prebuilt binaries for Windows are also provided. It should also be possible to built it from source (including on Linux) but this has not been well tested on systems other than our own. 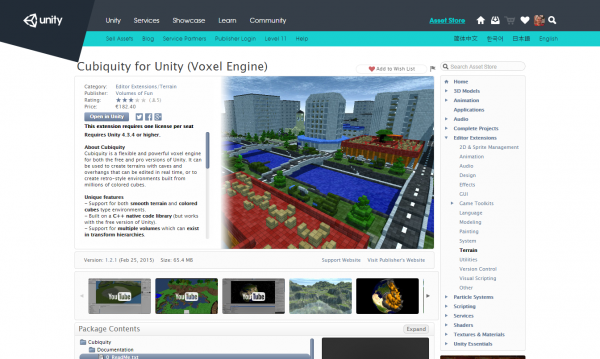 We put a lot of work into Voxeliens so we are pleased to now be able to share it with a much larger audience. Note that we do still have the option of selling it on Steam in the future (the Greenlight campaign remains valid) but it is not clear whether we will due to the setup, testing, and support required. At any rate, we hope you enjoy the game! I made the first public release of PolyVox nearly 10 years ago on the Ogre 3D forums. At the time it was just a simple demo to show how voxels and Marching Cubes could be used to create more dynamic environments, but over the years it evolved into a stand-alone library which has been used by several games and our own Cubiquity voxel engine. It’s been a big part of my life for the last 10 years, but as mentioned in previous blog posts I now have less time and am over-committed with the various projects I’m involved in. Therefore I have decided to officially cease development on PolyVox, though in practice it has not seen much work for the last couple of years. This follows the wrapping up of the current version of Cubiquity last year, and my plan is still to put the majority of my development time into ‘Cubiquity 2’. This will be completely new voxel engine with more limited scope and a focus on research rather than production use (i.e. for the more adventurous!). More generally, I have some intention of winding down the rest of ‘Volumes of Fun’ over the coming months and breaking Cubiquity 2 into a standalone organisation and/or project on GitHub. But the details of this aren’t really clear yet, and we also need to work out what to do with Voxeliens. For now the existing support channels (e.g. the forums) will remain open and I expect I’ll just provide email support if/when they disappear. Last weekend David and I took part in our first ‘game jam’ event. As part of Ludum Dare 33 we had 72 hours in which to make a game from scratch (or as close to that as possible) following a prescribed theme. You can find our live-updates that David was posting throughout the weekend on our Ludum Dare page (start from the bottom) but I’ll give a summary here. If you would like to play the game it’s available from our Ludum Dare page or directly from our website. You can also download the project source. Just a quick notice for those who have been waiting on news of the Unreal Engine 4 integration of Cubiquity. Today I have released a pre-alpha development preview of the plugin. Development is happening on GitHub under our new GitHub organisation. If you want to keep up-to-date with the latest developments, that’s the place to be. For information about how to test out the plugin, see the post on the Unreal Engine forums. Do note that this is still a very early release which while functional is quite rough around the edges. Expect bugs and missing features but do let me know on the Unreal Engine forum post if you give it a try or of there are features want. Cubiquity for Unity3D is now free! Well we’ve got some exciting news today – we’re pleased to announce that Cubiquity for Unity3D is now available for free! It has always been free for non-commercial and evaluation use, but we are removing this restriction so that you can use the system for commercial purposes too. This is effective immediately, and you can download Cubiquity for Unity3D via the asset store or from BitBucket. Cubiquity let’s you create natural voxel terrains and edit them in real time, or build your worlds from millions of tiny colored cubes. It’s been a little while since my last update on the progress of integrating Cubiquity with Unreal Engine 4 but plenty has been going on behind the scenes. Since the last video I’ve improved performance, added support for Coloured Cubes terrain, added LOD support, tested large map support and made sure that all of the functionality of Cubiquity is being exposed. A lot of time has just gone into making the code-base more future proof and reducing duplication between the different terrain modes. Check out the video below to see the new features in motion as well as me just blowing stuff up at the 9:42 mark. This more or less marks the features I wanted present for the first pre-release, so between now and then I will mostly be working on tidying things up and hopefully adding some initial documentation. I don’t have any ETA on the first release since this is fitting around my full-time job but any information will be posted here and on twitter. The best place to follow development is the WIP thread on the Unreal Engine Forums.